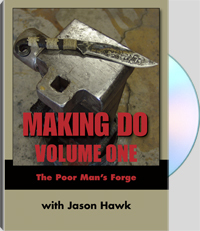 Jason Hawk has been forging greatly sought-after blades for years out of both high-quality steel and found materials, and in this video he teaches you how easy, inexpensive, and fun it is to forge weapons that will last a lifetime. He begins by showing you how to make your own forge and anvil out of a few cheap items, and then goes into testing found steel to see if it can be worked with. From there, he teaches basic hammering, shaping, and heat-treating to guarantee that your finished products will hold up under the wear and tear of real use. Focusing on two projects, a knife and an axe/adze, this video will give you not only vital survival skills, but also the knowledge and confidence to make your own weapons and tools no matter how primitive your surroundings are. Jason Hawk is a neo-tribal weapons specialist, a master bladesmith, and a primitive-skills instructor. A fourth-generation blacksmith, Jason learned these skills from his grandfather and father, who was a Special Forces instructor. By age 10, Jason was skilled at making traps, spears, bows, and knives, and received his Colorado guiding license on his 16th birthday. Jason has been making his own weapons and tools for 26 years and instructing forging and primitive living skills for 20 years. Among his students are military and law enforcement personnel. For the past two years, the Navajo Nation has contracted him to instruct their youth in forging, neo-tribal weapons, and primitive living skills. Jason has always relied on these skills to feed his family, including snaring rabbits in the desert and even taking a javelina with a blowgun, and he likes to serve his guests roadkill. The strangest forge he ever made was fashioned from a shoelace, an elk leg bone, and a T-shirt. He used two rocks for the hammer and anvil, and cow patties for the fuel. It was primitive, but it worked—and that's the point of his Making Do series.